Build a portable PSOne system with a 3″ TFT display, built-in battery pack, CD-ROM lid (on back) Analog controls, Player 2 port and memory card slot. This project can be constructed by using CNC-cut parts and other hobby materials. You’ll also need a soldering iron, X-Acto knife, wire, screwdrivers and other common tools. Due to the high volume of wiring required on a newer system like the PSOne, this is one of the more complex projects in the book. 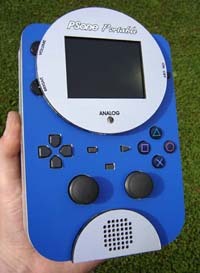 The two primary components of these projects are the original game systems, display and Sony Infolithium Type L battery. Below are the correct models to use, with a reference photo and easy-to-use automatic eBay search link. Be sure it’s for a “Type L” battery, or a multi charger that can fit a “Type L”. Other 7.5 volt batteries will work, however you may have to modify the project to get them to fit. I’ve separated the electronics parts list into what you can get online from Mouser (www.mouser.com) and what you’ll still need to find at Radio Shack. Therefore the two lists below are the same as the single list in the book. You’ll still need everything from both lists, but the more things you can get online from Mouser the cheaper it’ll be. Unlike Digi-Key, Mouser’s website has no minimum order so it’s handy for the experimenter, plus they have good prices. Please note that the items for modding the PSOne screen (10 ohm resistors and white LED’s) are also included on this list. Using this list you can easily copy/paste the part numbers into Mouser’s web site (or Radio Shack’s, below) to complete on online order. Sure beats typing! You can also use the eBay link above to the find right battery for this project. Below are the Radio Shack electronics parts. Mostly the bigger, more mechanical stuff, plus the PC boards. For remaining materials (screws, glues, plastics) please see the book. Contained in this single ZIP archive are all the files you need for this project. See book for more details. Includes templates, patterns and printable decal graphics.